What goes on behind the scenes, when the garden is closed to the public? Not to be mistaken for serious journalism or the main National Trust web pages, we just want to share the informal news, photos and ideas from the people who work here. We're delighted to be welcoming the renowned author Diz White on Saturday 26 June. She'll be here signing copies of her new book - aptly titled 'Haunted Cotswolds'. You'll be able to meet Diz and get an exclusive signed copy of her book anytime between 2pm and 4pm. 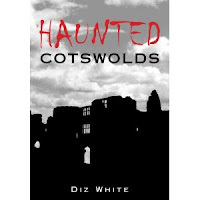 As the name suggests, Diz has gathered together spine-chilling tales of ghosts and the undead from every corner of the Cotswolds, revealing in heart-stopping detail our region's unexplained events that lurk beneath the rolling hills and beautiful visitas. British-born Diz, together with her husband Randall Montgomery whose photographs illustrate the book, divides her time between a career in Hollywood as an actress and screenplay writer, and her cottage in Gloucestershire, which she uses as a base for writing books about the Cotswolds. What is your favorite garden 'room'?